I'm still on a chicken kick, and a relatively ordinary one at that. Still, this one is quite yummy. Basically it is a more simple version of my Chicken with Dried Plums recipe that is made in a skillet. I omitted the extra liquids of chicken broth and white wine because the meat was cooking in its own juices. I probably could have sprinkled a bit of balsamic vinegar immediately after removing the dish from the oven, but I didn't think of that. 2. Coat bottom of a 9 x 13" baking dish with a drizzle of olive oil (about 1 tbs). 3. Sprinkle chicken with salt and pepper, add to pan, and toss to coat in olive oil. 4. 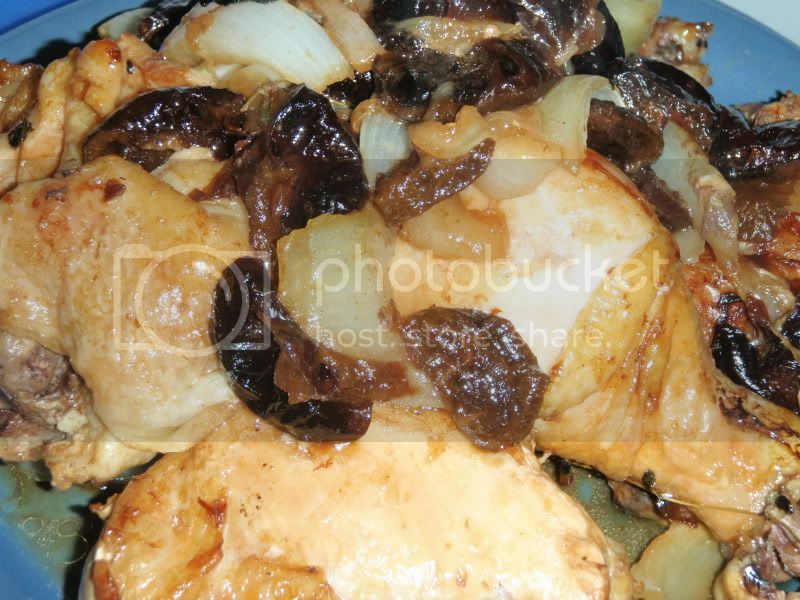 Place onion wedges in between chicken pieces. 5. Scatter plums and thyme. 6. Cover and bake for 60 until chicken is cooked through. Uncover for last 15 minutes to obtain a nice golden brown color. Serves 3-4 with a starch and a veg.